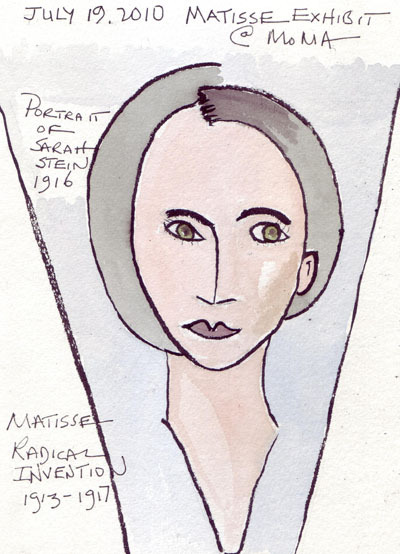 A new Matisse exhibit opened at MoMA on Sunday - entitled Radical Invention, 1913-1917. The paintings were somber in color and he was definitely experimenting with the human form, culminating in his painting The Bathers. 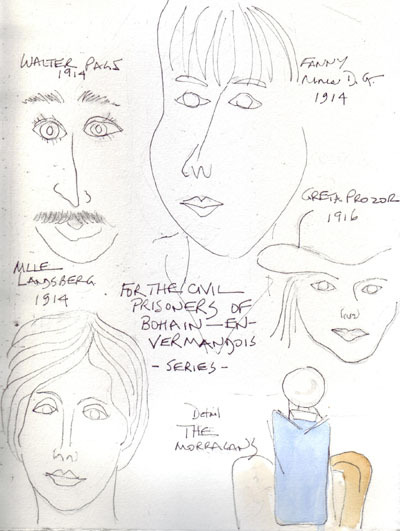 I sketched faces from one of his paintings and several of his prints for the Prisoners of Bohain-en-Vermandois. I then use3d one of the drawings to inspire my "Eyedropper Face" which is Lab 13 from the Carla Sonheim book Drawing Lab. 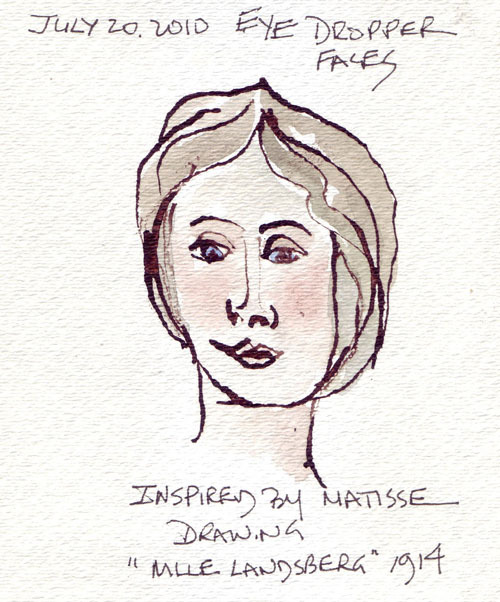 I used a small eye dropper and FW acrylic ink to draw the face, then painted it with watercolor. I'm really enjoying the "labs" in the Sonheim book - and will continue to work through them even though my art buddies returned home after our evening art sessions at our beach week. These are my morning journal pages from the second half of our beach week. 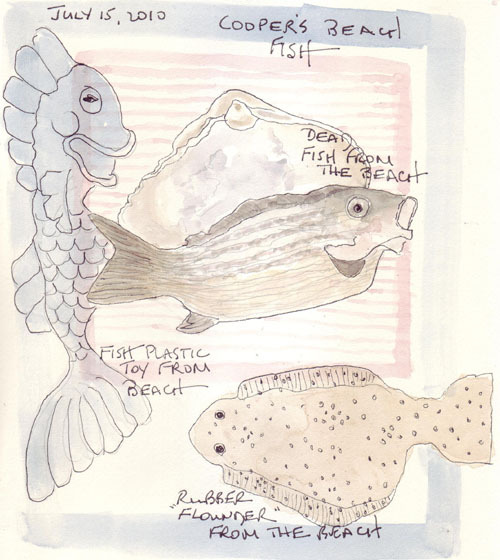 Each morning we would all go for an 8AM 2+ mile walk on the beach and the 3 wives collected things that we wanted to draw/paint while walking at the surfline. These were our beach treasures. 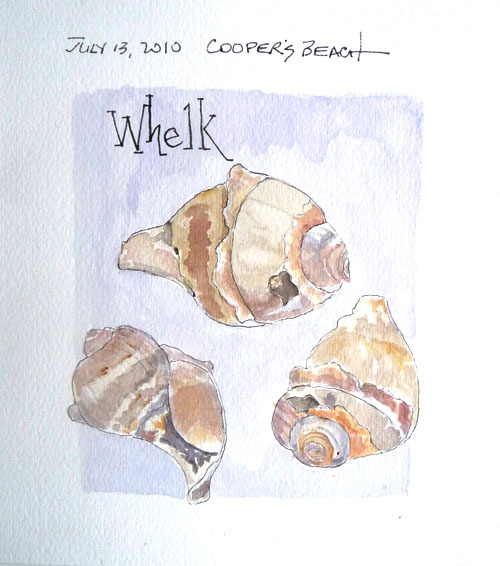 The shells were not very plentiful this week, in comparison to just one week ago when we we there for July 4th holiday. Morning 4: We found one small dead fish, one children's plastic toy fish (blue) and one toy rubber flounder covered in sand in addition to several other types of tresures. 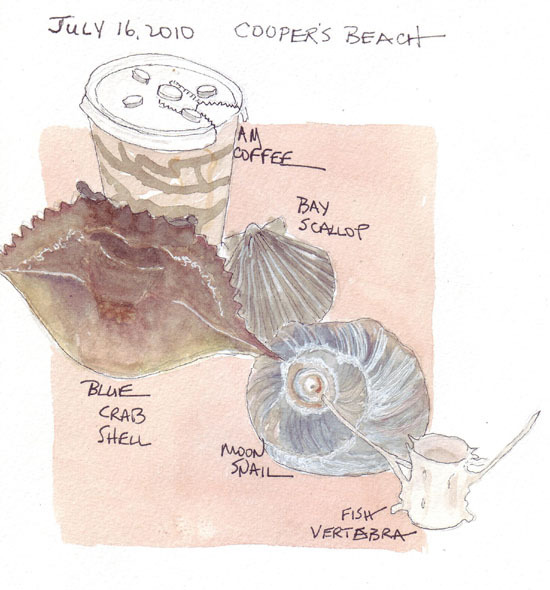 I sketched and painted these on one journal page as we set at the Cooper's Beach Snack Shack having coffee. Morning 5: I found a real assortment of things and put them all together as a still life with my empty coffee cup. 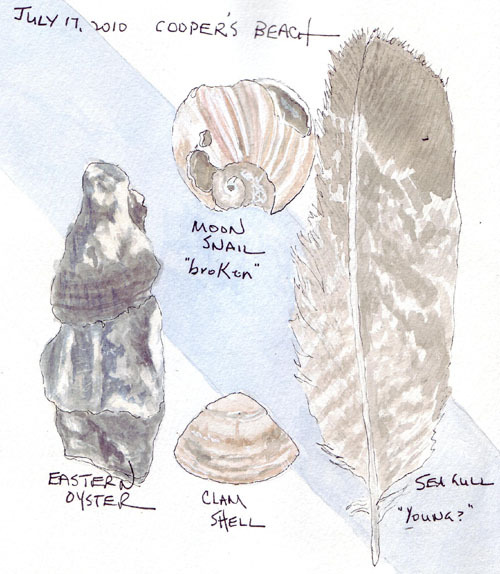 Morning 6: I found a few shells and a beautiful long gull feather from one of the brown spotted gulls. All week we used "google" to see if we could confirm that these large gulls were actually the young ones. Anyone know? 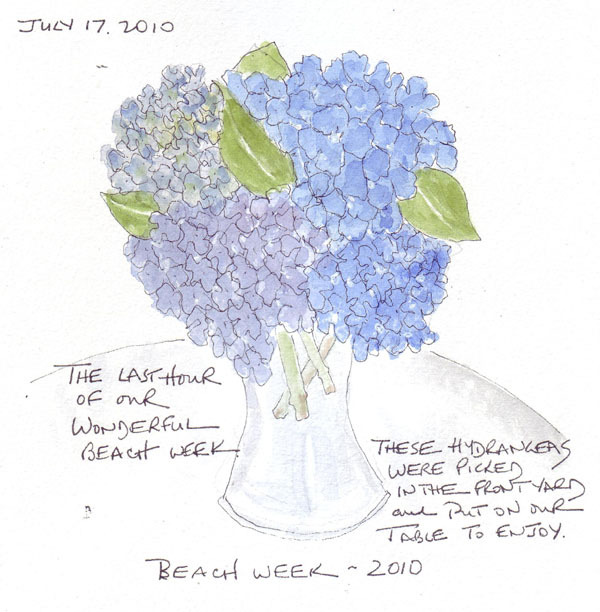 Departure: We kept a vase of fresh hydrangeas from the garden, in the kitchen, all week, and I finally decided that I needed to end my beach sketchbook pages with a painting of them. We are at the beach this week with friends - who we met in the 1960s. There are early morning beach walks, afternoon pool swimming, and lovely dinners on the house patio. 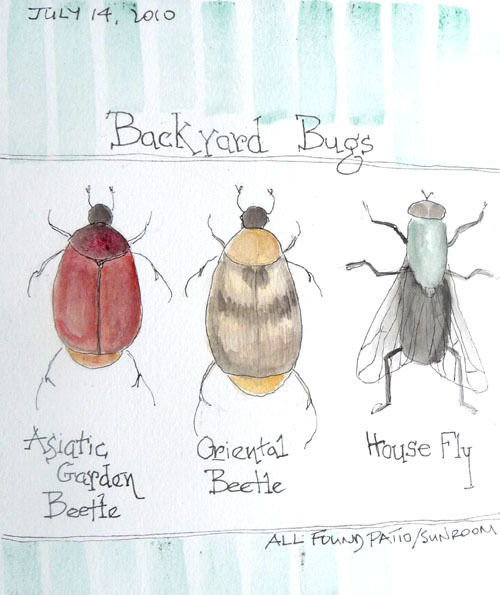 Three of us sketch together, so we are creating visual journal pages and having great fun doing "labs" from Carla Sonheim's new book entitled Drawing Lab. These are the visual journal pages from Mon-Wed. Mon and Tues we went to the beach. This morning we had a huge thunderstorm just as we were leaving and we spent the morning in the sunroom identifying bugs. Our group met at the Metropolitan Museum of Art on Saturday, instead of in Central Park, because of the threat of inclement weather. 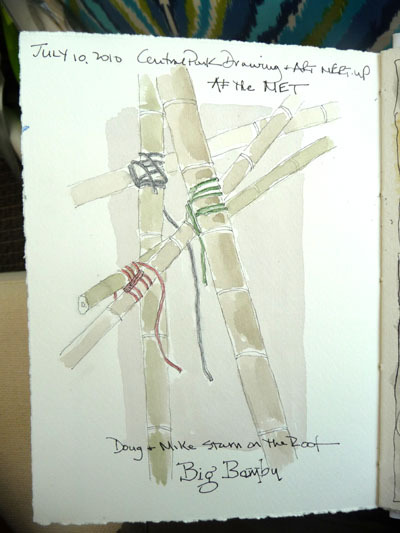 Our first drawing session was a major challenge - the Starn brothers bamboo structure on the Museum rooftop. I decided to really limit my scope and to focus on the method that they used to connect the bamboo and creat a structure which supports many people on internal walkways. 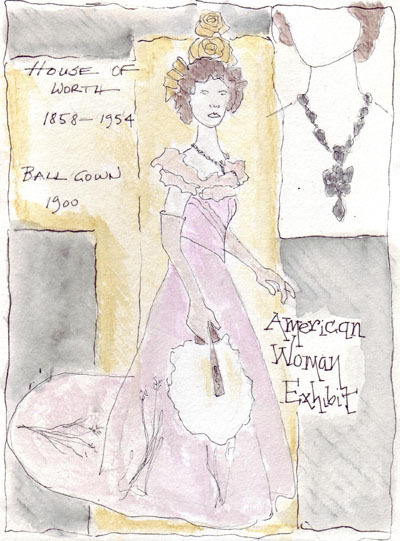 Our next drawing session was in the current exhibit called The American Woman - from the costume institute. I already sketched some of the fashions in the exhibit on a previous visit and this time concentrated on the room called "The Heiress." Our 3rd and final sketch was in 19th C. European Paintings. 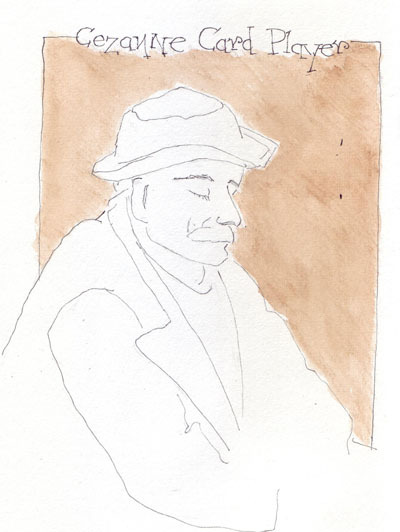 I am studying Cezanne's card players over a several year period and this time did a simple line drawing of one of the card players. For more information about this project and my 2007, 2008, 2009 paintings, click here. We just returned from a Holiday weekend with our children and their children. 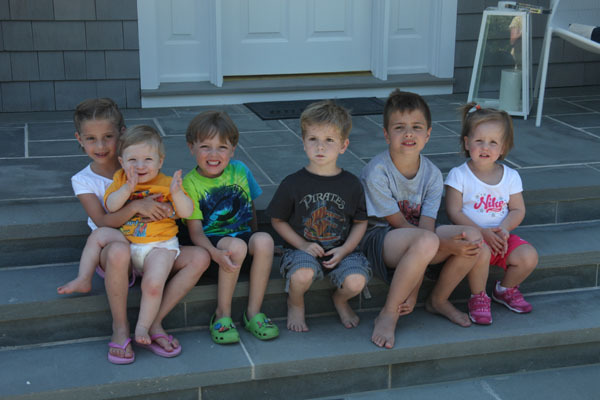 This is the first photo that we have of all 6 grandchildren this year - and I'm thrilled to have a new one. 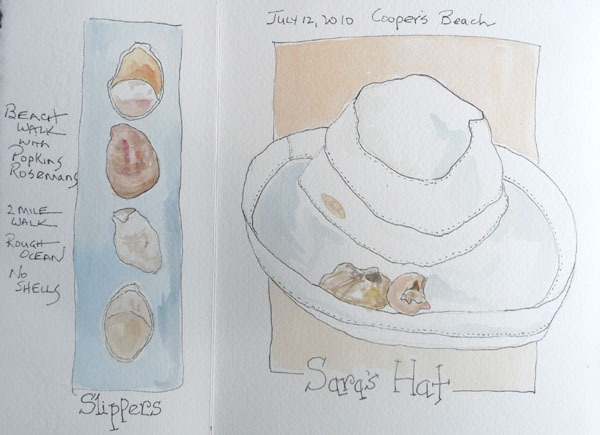 I sketched every day in my summer watercolor journal - in which I try to paint something that will help me remember the day. Here are 4 pages. 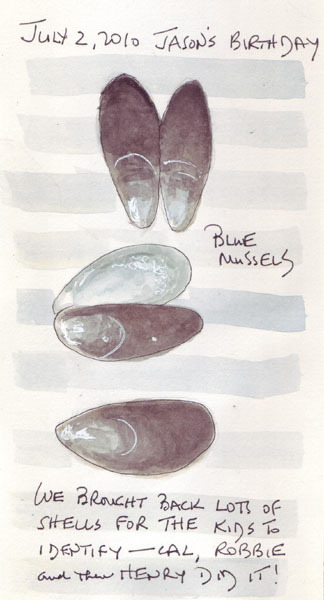 Blue Mussel Shells: I bought a wonderful laminated shell identification card which Callum calls "the map" and we tried to ID shells that I brought home from our beach walks. Our 3 and 4 year old grandsons made great progress "swimming" this weekend and spent lots of time going back and forth between their parents and the wall without floaties. 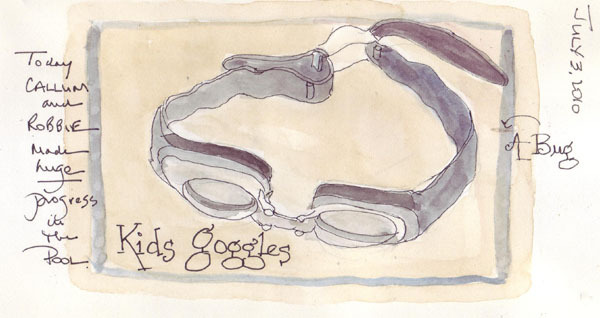 This is a pair of goggles that were abandoned on my chaise while I was watching them. 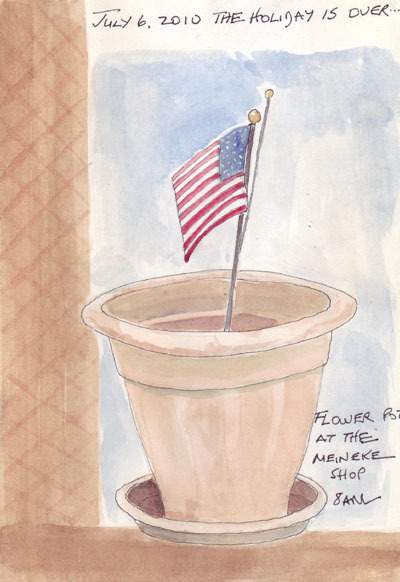 We waited for our car AC to have freon added and I was sitting next to this planter and flag - which looked especially forlorn after the holiday was over. I take sea gull pictures each time we walk on the beach. 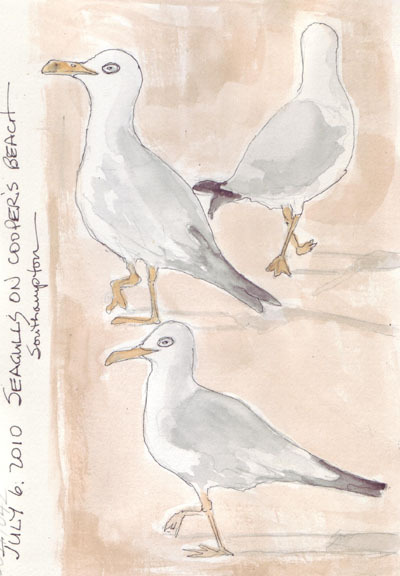 These are several drawings of one gull from those photos.